Amid police killings, protests, and clashes between hate and anti-hate groups, students in the United States have turned to the streets and social media to demand an end to institutionalized racism, on their campuses and beyond. A powerful anonymous note from a UNC student began circulating on social media this week, and it synthesizes the current state of affairs inside and outside the UNC campus, as well as connecting them to broader systemic and historical oppression in the US. We re-publish this note to amplify the voices of students who "are called by [their] collective humanity to end racial violence on [their] campus and in all aspects of our lives"
We’ve all come together in recognition that there is a crisis in our country and our campus is a part of it. This crisis is the governing logic of anti-blackness and white supremacy, which organizes our social practices, shapes our relationships, and drives our legislation. This logic is not simply a social construct – it has real consequences that we witnessed last week when Keith Lamont Scott was murdered in Charlotte. It has real institutionalized strength, so much so that NC legislators were emboldened, though ultimately defeated, to create discriminatory voting laws to stop black people from accessing political life in their own state. The violence we witness in our contemporary Black Lives Matter moment is not new, it is simply now being recorded, uploaded, and shared at lightning speed. It is bloody, it is overwhelming, and it must stop. UNC Chapel Hill is an institution and a community that is part of this larger racialized landscape and is its own microcosm of anti-blackness and white supremacy. When UNC was chartered in 1789, it celebrated the colonial taking of indigenous land in its use of “Carolina” to honor French and British monarchs. Its foundations were laid by enslaved African people whose descendants could not enroll until 1955. Even then, black students were not welcome: the doors were forced open by brothers Ralph and LeRoy Frasier and John Brandon, who sued and won against UNC after both their applications were rejected and the Board of Trustees passed a resolution barring black enrollment. Following desegregation, Black students were told to be thankful to have a place on campus, under the watchful eyes of Silent Sam, but that did not protect James Cates eleven years later. On November 21, 1970, Cates, a black undergraduate from the Northside neighborhood of Chapel Hill, was stabbed multiple times in the Pit by a Durham white supremacist gang looking for a random black target. Campus police refused to let anyone approach Carr to give emergency medical treatment, and he later bled to death after being put in the back of a cop car. In March the following year, an all white jury acquitted the assailants and in response students on campus damaged university buildings, including the use of firebombs. Two black students were arrested and imprisoned for their participation in the protest. Black death, black uprising, black incarceration. Repeat. Recent student activism around Silent Sam and university buildings named for slave owners and KKK Grand Dragon William Saunders used visible symbols of structural racism to bring attention to the continued marginalization and second-class status of black students, as well as the larger body of students of color and Muslims. These protests make visible the psychological trauma endured by black students who were told by the Chancellor that a neo-Confederate flag rally in 2015 was an opportunity for open dialogue. Black students who see black, Latinx, and Cambodian refugee workers threatened or fired for collective organizing. Who, according to a 2013 university report, numbered only 8.7% of the undergraduate student population and 5.2% of faculty in a state that is 22% black. Black student activists externalize their pain to force an unwilling audience to see the social-spatial ordering of UNC, which prioritizes white comfort and success. This was most visible in the faces of black men and women who stood outside then Saunders Hall in the winter of 2015 with nooses around their necks, holding signs stating “Black Lives Matter” and “This is what Saunders would do to ME.” Their faces are at once defiant and pained; one woman’s eyes are puffy from tears. Another pulls her noose tighter over her head as she yells out with her co-organizers to be heard. The UNC administration has shown time and again they are complicit in the logic of anti-blackness and white supremacy. Far gone are the days of overt racial apartheid –though the last KKK rally on Franklin Street was in 1987— in favor of “Diversity Plan” reports that chart the slow growth of “underrepresented minorities” without explanation or responsibility for why these students and staff are still not afforded an equitable place to participate, let alone make decisions, at the university. High powered administrators and board members are most concerned with maintain the school’s reputation and appeasing donors who wish to preserve their whitewashed memories of Carolina than address racial equity. The UNC Board of Governors reflects the current monopoly of state politics by pro-business conservatives: they are 87% GOP members, almost none attended UNC schools, but work towards a vision of higher education as having no other purpose than creating employable workers for profitable industries. In the last five years, the BOG have defunded or shut down multiple black studies and women studies programs marked irrelevant; closed a Poverty Center at the Law School; and supported North Carolina Senate Bill 873, the so-called “Access to Affordable College Education Act,” which deemed three Historically Black Universities in the system fodder for cuts that would effectively turn them into community colleges. More than a tacit silence in the face of black suffering, the university lashes out at community members who publicly condemn structural inequality. Just this January, four students were arrested and physically carried out of a Board of Governor’s meeting for protesting then incoming UNC system President Margaret Spellings, who has a long history in for-profit education and national legislation, most famously the No Child Left Behind Act, that contribute to school-to-prison pipelines. Moreover, when more than core student activists have come out in support of anti-racism, the university jumps to defend itself against critique. Last November, when the University of Missouri football team forced their university President to step down for failure to address racism on campus, student organizers were given space and a microphone in front of South Building to air grievances. Release your anger, reconnect with your fellow Tar Heels, just breathe. But, if we can salvage the brilliance of Martin Luther King Jr. from the sanitizing rinse of late, we remember that "the arc of moral universe is long, but it bends towards justice". 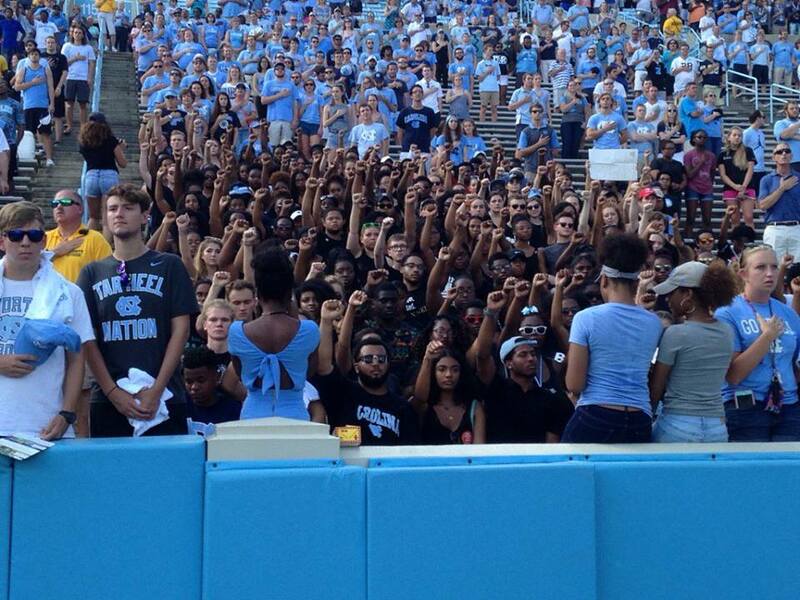 At the same time, Dr. King reminds us that the greatest hurdle to Black freedom is the white moderate and his call to wait for a “more convenient season.” Just this Friday, a multi-racial student phalanx showed up to the UNC-Pittsburgh football game in black shirts and raised their fists during the National Anthem. These students follow a long legacy of student, staff, and community activists who have not waited for the administration, or some promise of historical progress, to make change. We are able and we are called by our collective humanity to end racial violence on our campus and in all aspects of our lives. This is a tall order, but today we can come together to address these questions as a graduate student body. We embody and practice diverse intersectional identities and roles on campus and elsewhere, but we can come together here in recognition of our obligations to each other as colleagues and in our roles as teachers for undergraduate students. We pride ourselves on our professionalism, our conference presentations, and our hiring rates, but I want to take pride in knowing that we did not wait on the administration but took responsibility for making a truly inclusive and supportive environment for all students. To make anti-racism an active practice and commitment to everyone who walks into Hurston Hall.